A Quick Way To Fix Your Pricebook. 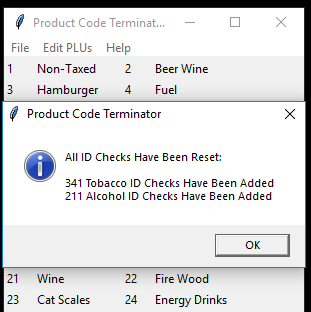 Product Code Terminator is a software tool written for use with Commander and Sapphire POS systems. 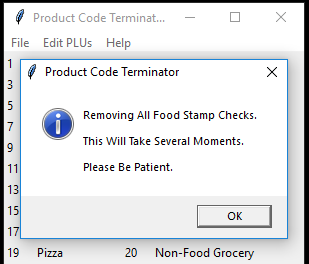 It allows you to easily manipulate the PLU file from the POS system. 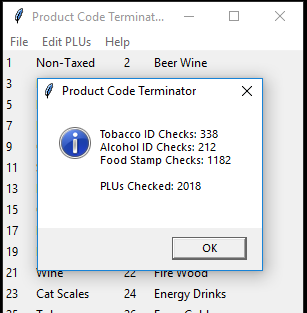 Originally designed to remove product codes from a PLU file, it now can help correct issues with food stamp check and ID check triggers from within the PLU file with ease. As always, before making any major changes to any system make a new and unique backup of your datasets. David Ray Electronics and More (DREAM) and Product Code Terminator is not affiliated with Verifone and all software is original. Please use at your own risk. David Ray Electronics and More offers no warranty on its use. After downloading the software tool you will find a few files and a directory. 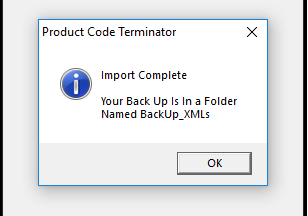 Place your ‘XML’ backup files into the directory called ‘Put_XMLs_Here’. 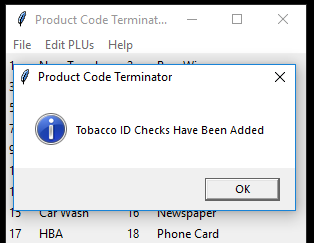 Then run the program called ‘PC_Term.exe’. Once it starts up and loads. It will import the dataset. At this time it also makes a backup of your dataset in a new folder. Once it is fully started up it will show a listing of all of the departments in the dataset. Also you will find a menu bar with options for ‘File’, ‘Edit PLUs’, and ‘Help’. Let’s go through the ‘Edit PLUs’ menu. First you will find ‘Survey PLUs’. 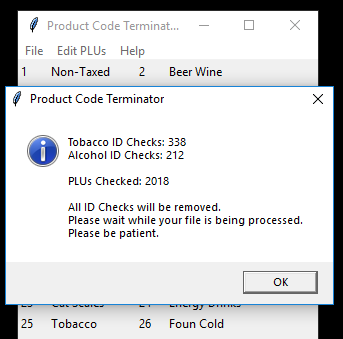 This analyzes your PLU file and will show you how many Tobacco ID Checks and Alcohol ID Checks you have. 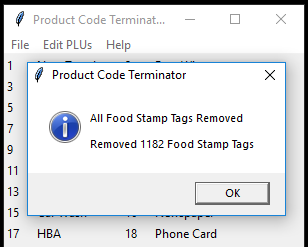 Along with how many Food Stamp Checks you have and a total number of PLU files in your dataset. This is a good opportunity to make sure your dataset is correct. If you it shows something like 100 or 200 PLUs and you know it should be more you should stop at this time and check your backup. This is sometimes caused by using the wrong version of SMS tool when pulling a backup from a Sapphire. 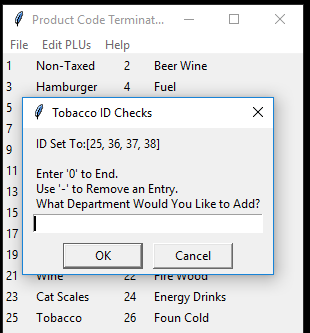 If you use ‘Edit PLUs – Remove Product Codes’ the software will go through your PLU file and set every product code entry to ‘none’. 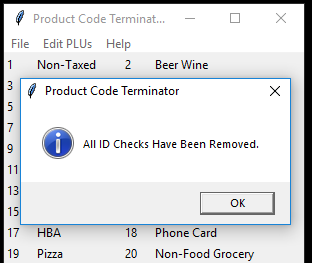 This erases every product codes in your PLU file. 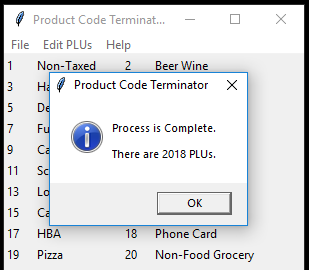 When there is no product code in the PLU file the POS will reference the product code entry to the associated department. 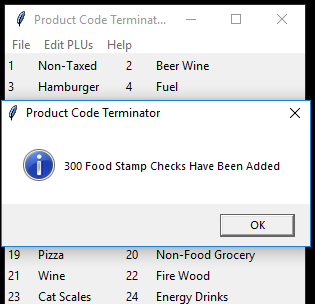 If you use ‘Edit PLUs – Remove Food Stamp Checks’ the software will go through your PLU file and remove food stamp checks from each record. If you use ‘Edit PLUs – Reset ID Checks’ the software will go through your PLU file and remove ID checks from each record. Then it will prompt you for each department ID that want to have a ‘Tobacco ID Check’ in. When you’re done you can press ‘0’ to finish. If you wish to remove an entry type the ID number in with a ‘-‘ (minus sign) before it and it will remove that entry. 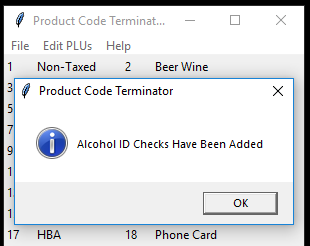 Then it will prompt you for each department ID that want to have a ‘AlcoholID Check’ in. When you’re done you can press ‘0’ to finish. If you wish to remove an entry type the ID number in with a ‘-‘ (minus sign) before it and it will remove that entry. Afterwards it will walk through your PLU file looking for PLUs in those departments and adding the required ID check for each PLU. 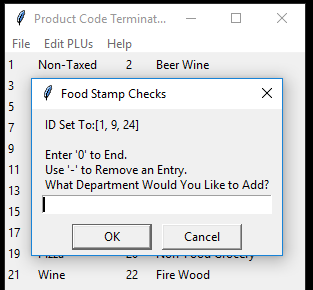 If you use the ‘Edit PLUs – Set Food Stamp Checks by Department’ option, it will prompt you for each department ID that want to have a ‘Food Stamp Check’ in. When you’re done you can press ‘0’ to finish. If you wish to remove an entry type the ID number in with a ‘-‘ (minus sign) before it and it will remove that entry. When you’re finished you can use ‘File – Export Dataset’ and it will build a new dataset for use with your POS system with all of the changes. 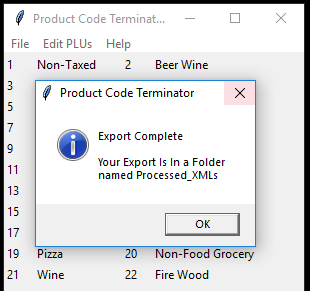 It will be in a folder called ‘Processed_XMLs’. These folders are date and time stamped so that you can easily find which one you’re looking for. This should fix your issues with your PLU file. 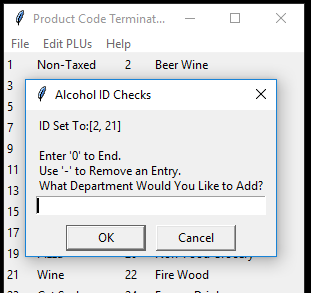 Don’t forget that this does not change any product codes in your department file. You will need to go and change those manually in your configuration software.